This movie shows the basic body plan of the ciliate Paramecium. It has cilia all over its cell. What are Ciliates? 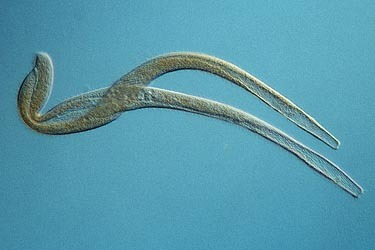 Ciliates are unicellular protists that can be recognised by their hairlike 'cilia'. They use them for locomotion and for feeding. 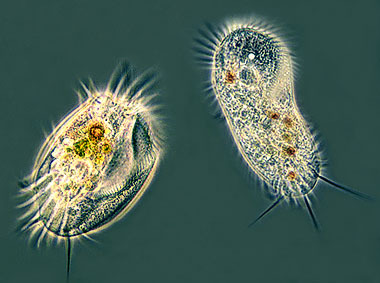 Some ciliates are very small, not much larger than the largest bacteria. Others like the 'trumpet animalcule' Stentor can reach a size of two millimetres so it can be seen with the naked eye. Paramecium does not become much larger than 0.3 mm. Below the centre of the organism you see the feeding opening. The cilia make a current to sweep in bacteria and other food particles. At the base of the feeding opening the food has been enclosed by a vacuole. Food vacuoles are used to transport the food through the cell. Star-shaped contractile vacuoles or water expelling vesicles are used to balance the amount of water in the cell. Two nuclei bear the genetic information. When you are less than a millimeter in body size, water acts like a thick syrup so swimming like a fish would not be an efficient method of locomotion. If you want to swim fast and with manouverability you need cilia, tiny hairs acting like paddles. Most ciliates are superb swimmers, some species are so fast that they are hardly visible when observed . Unicellular organisms possess organelles, special structures inside or on the cell that help to perform all kinds of tasks. Food vacuoles and the water expelling vesicles are such organelles. Many ciliates have developed all kinds of very special organelles. Paramecium uses so-called trichocysts: tiny pointed filaments that can be fired at a predator when threatened. Myonemes: they are fibers that act like muscles. We can see them in the stalks of bell animalcules like Vorticella and Carchesium. They are able to contract the stalk with exceptional speed. In the righthand image the myonemes are visible as the light wavy bands inside the stalks. In many ciliates fused cilia can be seen. Groups of cilia are fused into sheet-like membranelles. As undulating sheets they sweep in food particles. They can be seen in the bell animalcules. Other ciliates have thick round bundles of cilia called cirri which act like legs and enable the organism to actually walk over a surface. To coordinate these cirri independently they have nerve-like organelles called neurofibrils. 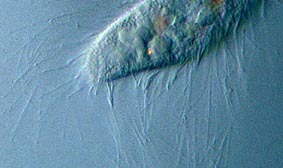 The top image of Euplotes and Stylonychia shows both types of cilia. 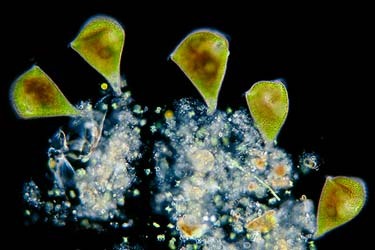 The trumpet animalcule Stentor is one of the biggest ciliates. Extended they can be 2 millimeters long and just visible with the naked eye. These green Stentors show a clever trick several other small organisms use. They are green because they make use of a symbiotic green algae called Chlorella. The page about Green algae will show these algae in Close up. 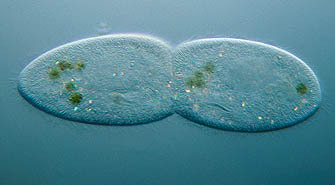 Ciliates usually multiply asexually by fission. The cell divides into two individuals. Here we can see a Paramecium undergoing fission. Once in a while we may also encounter a process which is called conjugation. These two ciliates of the genus Spirostomum cling to each other side by side and fuse together. In a complicated process they exchange the genetic material from their nuclei. After conjugation there is no offspring, the individuals have 'renewed' themselves instead. 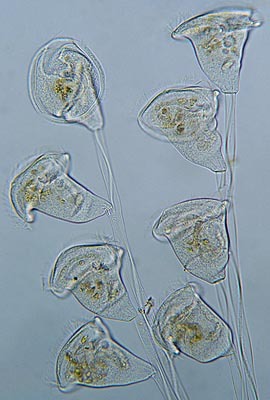 Most animals, even humans, have cilia similar to those of ciliates. These cilia are used inside our body, for example, to transport food particles or other material. A group of Paramecium cultured. Within a few weeks you will have millions. Make your own hay culture. It is not so difficult to raise Paramecium or other protists with a hay culture. Just boil a bit of dry grass for 15 or more minutes. Put the water in a bowl. Wait for a few days until a layer of bacteria begins to develop on the surface. Then add a few specimens that you collect from pond water (a stereo microscope is always very useful for sorting them out). But you can also put the bowl of water behind a window (out of direct sunlight) and just wait for what the wind carries. 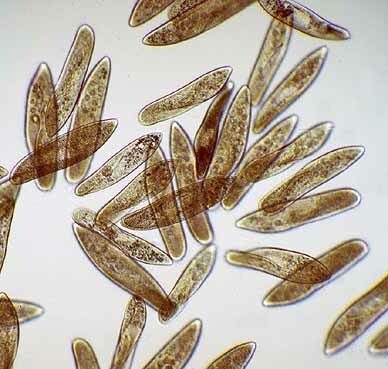 Many resting spores of microorganisms are carried with the wind. 'Tears of a swan' - Lacrymaria olor, the 'giraffe' of the protozoan world! Didinium- a master feeder A protozoan with attitude!